Trailing Stop in MT4, also known as Stop Loss, is developed to reduce losses in case the price is moving in the way that is unprofitable to trader. The tool is highly important for those who operates with large sums of money and performs numerous operations at one time, as well as for traders who works in the currency exchange environment of high risks. Stop Loss can be easily shifted by user to the break-even level, if the price becomes profitable again. Note: MT4 terminal needs to be connected. In case if MetaTrader 4 disconnected, the Stop Loss will not work. 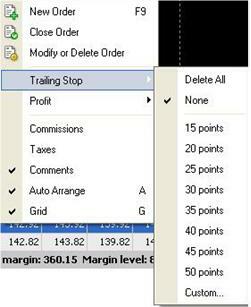 How can you set Trailing Stop in MT4? Take Profit Limits and Trailing Stop Loss should be sent to brokers in order to make them now, when to stop your order. This option will be always performed even if you have closed your MT4 platform. However, Trailing Stop has another operating principle. In this case, MT4 should be switched on, since a new Stop Loss is sent to broker continuously. In this case the broker will know only the last Stop Loss number that was received before MT4 shutting down. 15 Points .. 50 Points: These are default Pips levels/points. You can choose the custom command in case you are not interested in this feature. Custom option opens the Custom Trailing Stop Window, which enables you to set your Stop Loss manually. Choose all the options and click OK button. Now your Trailing Stop was successfully saved. You can easily disable it by choosing “None” in the Stop Loss sub-menu. Set Trailing Stop in MT4 and stop worrying about possible losses right now!